Our Products >> Klean Strip S-L-X Denatured Alcohol 3.785 L.
Shellac Thinner:Shellac cut with Klean Strip SLX Denatured Alcohol cleans shellac brushes after use. 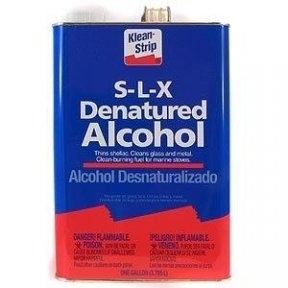 Cleaner: Klean Strip SLX Denatured Alcohol is a superior, fast-evaporating cleaner. Use full-strenth to clean non-lacquered jewelry, and printing inks from rubber rollers and metal parts. Dilute one part SLX Denatured Alcohol with two parts water to clean glass, porcelain and piano keys. Fuel: Klean Strip Denatured Alcohol produces a hot, clean, odorless and smokeless flame in alcohol stoves.